Introduced in 2009, the BMW F800R was introduced as the firm's entry-level sporty naked bike, designed to take on the likes of the Triumph Street Triple, Honda CB600F Hornet or Yamaha's FZ6. While the humble Beemer is not as popular as the likes of Triumph's British triple, it's still a cracking bike, complete with a 798cc parallel twin that loves to be revved, giving off the same levels of excitement as a sportsbike. As well as having a sweet-sounding and performing engine, the F800R is taut and precise, with a stiff chassis and suspension developed to work in conjunction with it. Under braking and through turns, it also feels settled and compact. Away from the twisties, there is also a goodly amount of steering lock and low-ish seat height, meaning the F800R is a good traffic-buster in the urban sprawl. "This is a very pampered bike, never ridden in the rain, with brand-new never used Shad Panniers and flyscreen that's deflects wind from your shoulders. 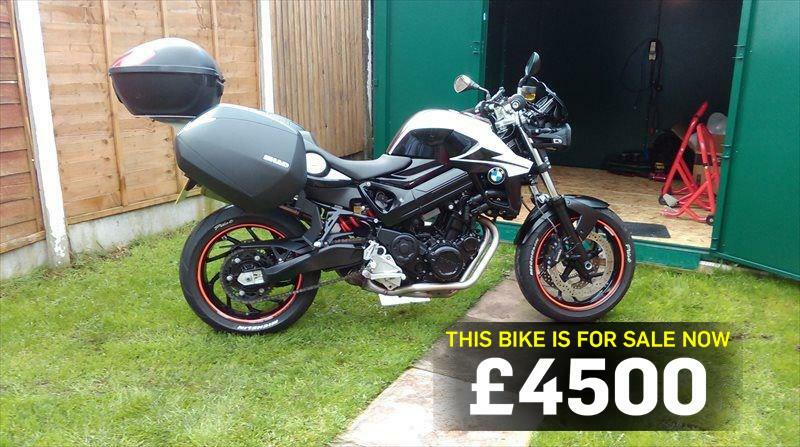 "The bike has done just 10,200 miles since 2014 and also comes with heated grips and a BMW satnav. It has just had a fresh MOT and service by a local BMW Dealer, along with a new rear tyre. It's also got a nice and low seat height for us shorties."